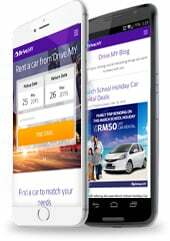 KSE Rent A Car , our proud partner of Drive.MY! KSErac has been in the car rental industry since 2010 and we work hard with one goal in mind i.e to become your efficient and friendly car rental provider. In KSErac, quality service is our utmost priority. Thus, all our staff are professionally trained and our fleet of vehicle is highly maintained in order to provide you with a pleasant and smooth car rental experience. Our motto “Drive Happy” speaks our mission… Rent a car with us and feel the difference!